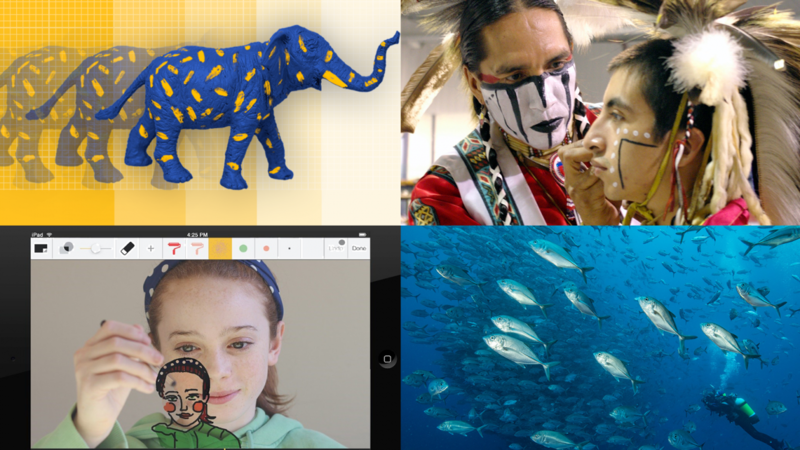 Launched in December of 2011, the NFB’s PixStop app for iPad has been completely redesigned and is back with a bang under the name NFB StopMo Studio. This updated version of our stop motion animation (also known as “pixillation”) app boasts several new features in both visual and audio editing, including automatic time-lapse photography, digital drawing, title cards, frame-to-frame transparency, new visual and sound effects, and more. These functions may seem intimidating at first, but the app is actually quite easy to use. The team who developed NFB StopMo Studio, under the leadership of designers Mivil Deschênes and Jean-Sébastien Beaulieu in the Platform Development department of the NFB, began by creating a simple and easy-to-use tool meant for the general public. Regardless of the fact that NFB StopMo Studio is the most sophisticated stop motion animation app on the market, it was originally designed for users like you and me. Thanks, NFB team! One of the collaborators who participated in the redesign of our app is none other than animation filmmaker Patrick Bouchard (Bydlo, Subservience). After testing similar applications, including the now-defunct PixStop, Bouchard offered his expert opinion to the design team. In fact, this transparency function is a trick often used by animation professionals in the studio. “Filmmakers are always trying to test sequences of images in order to create more fluid movements,” says Mivil, adding that a tutorial explaining each of the app’s functions will soon be available. Due to popular demand: new features! While using PixStop, many of you told us that you’d like to have the option of importing images from your iPad photo gallery into the app. You asked and we answered! It’s now possible to import external images into the app. What’s more, it’s now also possible to save your films in mp4 format on your iPad, so you can share them with your friends and family on Vimeo, Facebook, or by email. And what can you do with this awesome app, you ask? Lots of neat things! For example, you can create a sped-up stop-motion video of your friend’s hockey game, create your very own Toy Story by animating your kid’s favourite toys, make a tribute film for a birthday, retirement, or other special occasion, create a film out of your vacation photos, or even test your patience by trying out the app’s rotoscoping function (which allows you to draw directly onto frames you’ve shot). Let your creative juices flow—the only limits are in your imagination. Feeling lucky? Follow the NFB on Twitter for a chance to win a free NFB StopMo Studio download code over the next couple of days! Head over here to watch a short video on how you can make your own iPad tripod, since stop-motion animation requires the stillness of the camera. And, discover all available NFBs apps here. Thank you for your comment. I have forwarded your query to our client services, which should contact you shortly. Thank you for your patience and interest in the NFB! “The issue concerning the App is linked to the new iOS10. Regrettably, it was more extensive than anticipated, and for this reason we haven’t been able to correct it as quickly as we would have liked. However, our Web and Technical teams are working very hard to fix this as soon as possible. We anticipate that an update to the app will be available at the end of January 2017. Before I download this app, I would like to better understand the audio editing capabilities. Can you add voice and then edit it? Hi. How do I save a movie to the camera roll? On export, I get a message that the file “exceeds the sharing limit allowed by mail”. Is it possible to remove/hide rigging with this app? The image is imported on a single layer, but cannot be dragged around. 1 A green or blue screen tool so they can create more varied backgrounds. Thank you for creating such an inexpensive and easy to use tool allowing young story tellers another way to bring their stories and ideas to life. Thanks for your feedback Richard, and we are glad to know you and your students are enjoying the app. I will pass your input on to our web team. How can we get a Stopmo Studio movie off the iPad (and ideally into iMovie on a desktop machine) ? The export options seem limited to texting or emailing. Texting is a reduced resolution option, and emailing seems to be limited in size. We’re hitting limits around 600 frames, using Gmail, and we get error messages. Alternatively, is there a way to duplicate films, so we can chop them into smaller pieces to email. Any suggestions? Hi Kurt, you should be able to save the movie to Camera Roll, and then plug your device in to your desktop and transfer the saved file. What kind of error messages are you receiving? Stop Motion Madness! Students Create StopMo Films! Watch an adorable selection of StopMo films from the First Annual Highfield International Film Festival in Etobicoke, Ontario. Make your animation leap to life with this handy guide detailing the 12 principles of animation.